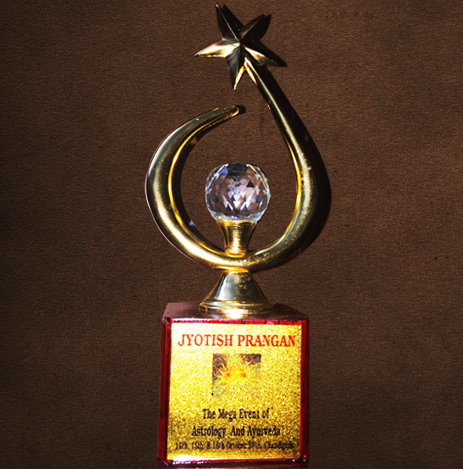 In October 2016, veteran and globally admired astrologer Ankit Sharma achieved another high and dignifying award named as the "Jyotish Prangan Award" in Chandigarh, where the head office of his globally prominent service-firm is well-based. 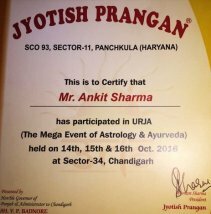 This prestigious award was conferred on him during an international event named as 'URJA - The Mega Event of Astrology & Ayurveda', held from 14th - 16th October 2016 in Chandigarh at Dussehra Ground of Sector-34. Over 100 eminent astrologers, Vastu specialists, Ayurveda specialists, and Tarot Card readers belonging to India and abroad had participated in this highly enlightening and laudable event. "Urja" was organized jointly by Jyotish Prangan and Planet Ayurveda. Jyotish Prangan is a Panchkula-based organization working for the regeneration and betterment of Astrology. The Jyotish Prangan Certificate and Award were presented to astrologer Ankit Sharma by the chief guest of the event, Shri V.P. Singh Badnore Hon'ble Governor of Punjab & Administrator to Chandigarh. Troubled people of the world over, may readily call over: +91-98154-18307; or send their curiosities or problems to: info@AstrologerAnkitSharma.com; to get the best possible and cheapest astrological and other solutions.